If you like to use washi tape in your crafts, then you will love the We R Memory Keepers Washi Chomper! The Washi Chomper makes fun flag, arrow and fishtail shapes on the end of your tapes, meaning that you can make your own accents for your papercrafts, journals, planners and anything else you’d like to decorate. Simply by adjusting the alignment guide to the width of your tape, feeding the tape through and then pressing to cut, you can create a whole host of designs, such as banners, tabs, arrows and chevrons. But – the Washi Chomper isn’t exclusively for cutting washi tape! You can also cut ribbon and paper with this tool. We love getting the most out of our crafty gadgets, so today Maxine is going to show you some innovative ways for using your Washi Chomper. We love DIY home décor and this piece is no exception. Using the wonderful new Let’s Celebrate paper pad from First Edition, we’re going to create a chic piece that you can display anywhere in your home. 1. Cut a piece of backing paper to fit the backing of your frame and stick this down. 2. Cut a selection of the beautiful Let’s Celebrate papers into strips. Use your Washi Chomper to create different shapes from the paper. 3. Cut a variety of shapes by feeding your paper into the Washi Chomper. Turn your paper pieces depending on which type of shape you want to create. 4. Adhere the shapes to the frame backing in rows, using a strip of paper to keep the shapes in a straight row whilst sticking them to the backing. It’s a good idea to plan where you’re going to stick all of your shapes before you stick them, just so that you get the layout right. Whilst we adhered some to the backing paper flat, we used foam pads to adhere some of the shapes to add definition. 5. Add further texture and definition to your design by putting some gold mirrored card, once cut, through an embossing folder. 6. Finish adhering your paper pieces to the backing paper. We created a variety of chevrons and diamonds in different sizes, out of a variety of papers. 7. Fit the frame backing into the front of the frame. You now have your finished piece of wall art, ready to display! We really hope that you had as much fun creating this design as we did. The Washi Chomper is perfect for adding accents to your cards too! Ideal for using up scraps of paper that you don’t want to go to waste, why not finish them off with a fishtail design and adhere them to a card blank for a simple yet colourful design. 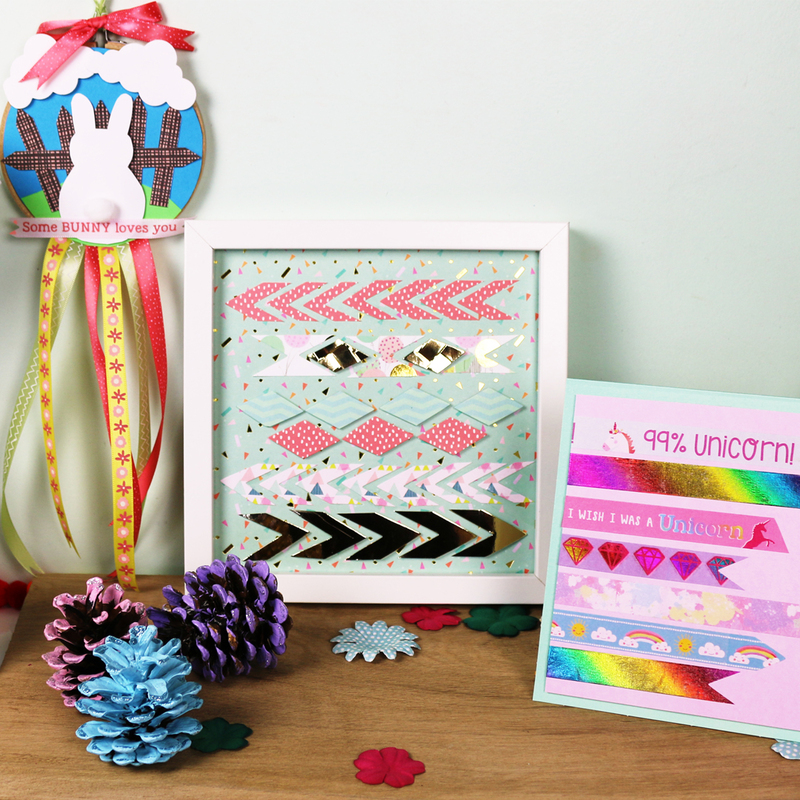 The Dovecraft Unicorn washi is almost too cute to use, but with a fancy fishtail finish to one end, we adhered it to a card blank to create a fun and fabulous design. The We R Memory Keepers Washi Chomper also cuts ribbon! Maxine created a cute Easter make with an embroidery hoop and foam sheets before adding a sentiment, bow, and ribbon tassel that were finished using the Washi Chomper. Have you got your hands on this tool yet? We’d love to see what you create with yours if you do, so don’t forget to #Trimcraft when uploading to social media and to share your projects in the Inspiration area.